BBiomedSci, MBBS (Hons), FRACGP, member ACNEM, member AIMA, Personal Fitness Trainer (P.T. ), Health Coach. As an expert in nutritional and integrative medicine Dr. Cris specialises not just in the prevention and treatment of illnesses, but in the attaining of optimum health. She believes that this state is achievable for anyone and passionately shares this message with her patients. Dr. Cris believes a person can develop resistance to illnesses that plaque our society today including premature aging, obesity, diabetes, heart disease, cancer, osteoporosis, emotional and mental health problems, as well hormonal problems. By employing simple lifestyle strategies and where necessary integrating complementary and conventional medicines, Dr. Cris believes that a restoration of health and vitality can be achieved. 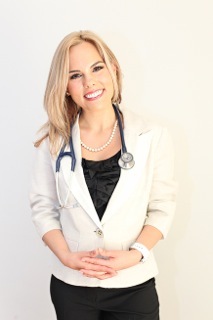 Dr. Cris holds qualifications in medicine, biomedical science, integrative and nutritional medicine, health coaching, as well as personal fitness training. She completed her medical degree from Griffith University in 2008 and is further qualified as a registered General Practitioner with the Royal Australian College of General Practitioners. She has undertaken training with the Australian College of Nutritional & Environmental Medicine (ACNEM) as well as the Walsh Institute. The later involves Biobalance training which focuses on the restoration of normal brain biochemistry in the setting of anxiety, depression, and other mental health disorders. She has also undertaken health coaching with Health Coaching Australia and is an expert in coaching towards weight management. Aside from working in medical practice Dr. Cris is the medical program developer for The Biggest Loser Retreat in the Gold Coast Hinterland, which has alliances with the television show of the same name. Dr. Cris is sought after by the media for regular commentary on Juice FM and web TV. She is also a requested speaker at numerous functions and events. Dr. Cris regularly writes a women’s health column for Indulge magazine. She updates a regular blog with current health and lifestyle information and tips. The latter can be found at www.drcris.com.au .